Many Americans believe that increased access to paid family and medical leave would reap positive benefits in a number of ways, and most say that offering paid leave can give employers an edge in employee recruitment and retention in a competitive marketplace. At the same time, the public sees the challenges that some employers – particularly small businesses – face in providing paid family and medical leave benefits for their employees. When asked what the consequences would be if all Americans had access to paid leave for family or medical reasons, about nine-in-ten or more say that this would have a very or somewhat positive impact on families, women and men. And about two-thirds (65%) think the impact on the economy would be positive as well. Views of the impact on employers and small businesses are more mixed, with 53% saying universal access to paid leave would have a positive impact on employers and just 41% saying the same for small businesses. Despite widespread support for paid leave and positive views of its impact on families in particular, many Americans have concerns that some workers exploit these policies by taking time off from work when they do not need it. More than half say it is common for workers to abuse paid family and medical leave in this way (16% say this is very common, while 39% say it is somewhat common). Republicans are more likely than Democrats and independents to perceive the abuse of paid leave benefits as common. The overwhelming majority of Americans see paid leave as having at least a somewhat positive impact on women (93%) and families (94%), including 62% who say paid leave would have a very positive impact on each. About nine-in-ten (88%) also say that if all Americans had access to paid leave, the impact on men would be at least somewhat positive, but fewer (42%) say it would have a very positive impact. And while most (65%) see the impact of universal paid leave on the economy as generally positive, just 21% say it would be very positive. When it comes to effects on employers, assessments of the impact of paid leave are more mixed, though somewhat more say its impact on employers in general would be at least somewhat positive (53%) than say it would be at least somewhat negative (46%). When asked about the impact of paid leave on small businesses specifically, the balance of opinion shifts further – about four-in-ten (41%) say that access to paid leave for all Americans would be positive for small businesses, while 58% say the effects on small businesses would be negative. Larger shares of Democrats than of Republicans or independents say that if all Americans had access to paid leave, the impact on employers in general and on small businesses in particular would be at least somewhat positive. Among Democrats, 64% say the impact on employers would be positive, and 52% say the same about the impact on small businesses, compared with 41% and 30% of Republicans, respectively. Partisan differences are also evident when it comes to the impact of universal paid leave on the economy (77% of Democrats and 64% of independents say it would be positive vs. 52% of Republicans). 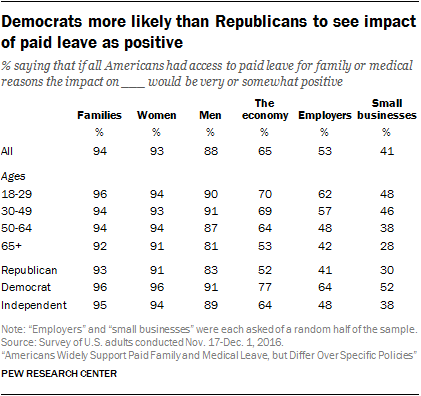 And while large majorities across partisan groups say paid leave would have at least a somewhat positive impact on men, women and families, Democrats are far more likely than Republicans to say the impact on each of these would be very positive. Americans ages 65 and older tend to hold less positive views than their younger counterparts concerning the impact of universal paid leave on employers, small businesses and the economy. For example, roughly half (53%) of adults 65 and older say the impact on the economy would be positive, compared with 70% of adults 18 to 29, 69% of those 30 to 49, and 64% of those 50 to 64. About six-in-ten Americans (59%) – including similar shares of men and women, as well as adults across education and income levels – say that most employers that provide paid leave for family and medical reasons can afford to do so without reducing salaries or other benefits. 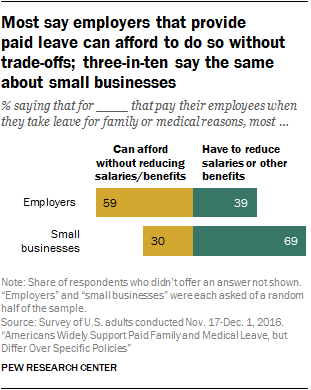 When asked specifically about small businesses that provide paid leave, however, far fewer (30%) say this type of employer can afford to provide this benefit without reducing salaries and other benefits. As with other attitudes concerning paid leave, differences emerge across party lines. Fully 68% of Democrats say most employers that pay their employees when they take leave can provide this benefit without cutting salaries or other benefits, compared with 56% of independents and 47% of Republicans who say the same. And while four-in-ten Democrats say most small businesses that provide paid leave can afford to do so without reducing salaries or other benefits, three-in-ten independents and even fewer Republicans (21%) share this view. Whites and Hispanics also offer differing views about the trade-offs employers may need to make in order to provide paid leave, with Hispanics far more likely than whites to say most small businesses – and most employers in general – that provide paid leave can do so without reducing salaries and other benefits.2 For example, 58% of Hispanics say this is the case in regard to small businesses, compared with just 22% of whites. Those with household incomes below $30,000 are also more likely than those with higher incomes to say most small businesses that offer paid leave can do this without reducing salaries or other benefits. While those in the lower income group are about evenly divided, with 47% saying small businesses can afford to do this and 53% saying they cannot, majorities of those with incomes between $30,000 and $74,999 (67%) and those with incomes of $75,000 or more (77%) say most small businesses can’t afford to provide paid leave without tradeoffs. In spite of the potential trade-offs that may be involved in providing paid leave, most Americans think that employers stand to gain by offering these benefits, particularly in employee recruitment and retention. About three-quarters (74%) of Americans think that employers that pay their employees when they take leave from work for family or medical reasons are more likely than employers that do not provide paid leave to attract and keep good workers, including 57% who say that these employers are a lot more likely to do so. Only 19% say that providing paid leave does not make much difference in an employer’s ability to recruit and retain good workers. The view that providing paid leave puts employers at an advantage when it comes to recruitment and retention is widespread across demographic and partisan groups. For example, about eight-in-ten Americans with at least a bachelor’s degree (81%) say that employers that provide paid leave are more likely to attract and keep good workers, as do 74% of those with some college experience and 69% of those with a high school education or less. And at least seven-in-ten Democrats (77%), independents (76%) and Republicans (71%) hold this view. Although most Americans support paid family and medical leave, many also express concerns that these policies can be abused. Some 55% think that when workers have access to paid leave for family or medical reasons, it is at least somewhat common for them to abuse this benefit by taking time off when they do not need it. 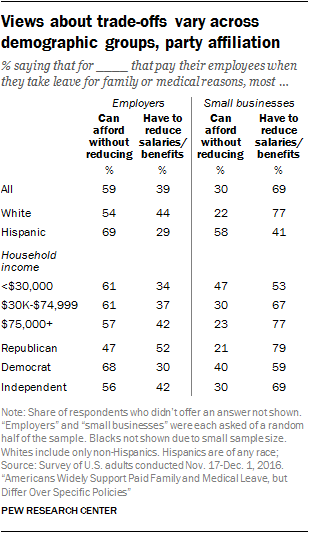 Overall, 16% say exploiting these benefits in this way is very common, and about four-in-ten (39%) believe it is somewhat common, while a similar share (38%) think it is not too common and 6% say this is not at all common. Republicans are far more likely than Democrats and independents to think it’s at least somewhat common for workers to abuse paid family and medical leave benefits by taking time off from work when they do not need it. Two-thirds (67%) of Republicans think this is common, compared with 46% of Democrats and 55% of independents. Views on the prevalence of paid leave abuse also vary by education. About six-in-ten (62%) adults with a high school education or less say abuse of these benefits is at least somewhat common, compared with 55% of those with some college experience and 46% of college graduates. The survey also finds that a larger share of Hispanics (62%) than whites (55%) or blacks (49%) say that workers commonly exploit paid leave by taking time off from work when they don’t need it.